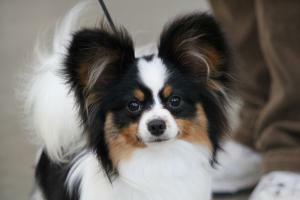 The Papillon or ‘butterfly dog’ began life centuries ago, although it is difficult to pinpoint where and when. Some sources claim the breed was well established in parts of Europe by the 1200s, although it could have been much later. Whatever the truth, the popularity of the Papillon has endured the test of time, which is evidenced by continued interest and high ownership rates around the world. Judging by artwork from the 1500s, the Papillon can be traced back to the Renaissance where it was common in the households of European royalty. Some argue the Papillon developed from Asian toy breeds like the Japanese Chin, although it is generally accepted that the breeding of small-size spaniels was behind it. Whether the Papillon is native to France, Spain or Italy is uncertain; with artwork from across the continent suggesting it had far-reaching appeal. While Spain is believed to have instigated the breed’s popularity, it was the region of Bologna, Italy, that traded the largest number of these dogs, helping to distribute them across Europe. A group portrait of Louis XIV found in the Wallace Collection in London clearly depicts a Papillon alongside the royal family. Other portraits of this kind also reveal toy spaniels with fringed, upright ears like those of the Papillon. Clearly the dogs were valued highly enough to feature in artwork of the time. Besides being fashionable lap dogs to royal women, Papillons were also popular ratters, capable of hunting down vermin and ‘bothering’ it to death, rather than tearing it apart and leaving an unsightly mess. They were friendly and intelligent, as well as being fierce and tenacious when they needed to be – the perfect combination for a noble dog. Their associations with royalty gave birth to a whole host of stories – some true, some fictitious – which portrayed the little Papillon as the most loyal of companions. Marie Antoinette is said to have been a huge fan of the breed, so much so that one even accompanied her to her execution, carried discreetly under her arm. Fortunately for the little dog, it was spared the same fate as her and was taken in by members of her household. However, the noble connection wasn’t all sunshine and roses. In fact, because of their association with royalty, many Papillons were slaughtered during the French Revolution, including a number of other breeds like the Clumber Spaniel and the Dogue de Bordeaux. After this time, careful breeding efforts were necessary to try and restore the breed, improve its numbers and return it to its former glory. In 1901, the Papillon made its first appearance in Britain, where it was keenly received by upper-class families. The Kennel Club officially registered the breed in 1923. - When Marie Antoinette was beheaded, her two pet Papillons were looked after by the residents of her home; in time, the property adopted the name ‘House of the Papillon’ which it retains today. - There are records to suggest that Henry II spent in excess of 100,000 crowns on his beloved Papillons. - Henry III owes his death to not having listened to his pet Papillon, Lilin. The little dog showed great hostility to a visiting monk intent on speaking privately with the King. When Lilin was dismissed from the room after efforts to calm her down were unsuccessful, the monk plunged a knife into the King’s abdomen, resulting in his death the following day.